A remarketing email is a targeted and personalized message that convinces otherwise lost customers to complete their purchase. It enables marketers a second chance at converting the site visitors who abandoned before converting. When implemented intelligently, an email remarketing campaign can increase overall conversions by as much as 25%. A few weeks ago, we took a trip back to basics to explore the topic, “What Is Remarketing?” While that post does a good job of giving a high-level explanation of remarketing, it doesn’t get granular and look into the fundamental piece of remarketing–the email. In today’s post, we’re going to explore the more-specific question of “What Is a Remarketing Email?” to give you some insight into the strategies behind some of UpSellit’s most successful campaigns. Before we dive into the contents and characteristics of remarketing emails, let’s briefly discuss the different types messages. There are a few different types of remarketing emails, each tied to a different piece of the conversion funnel. Cart Abandonment Emails – As we covered in our previous post, a cart abandonment email is an email sent from a merchant directly to a consumer who left their website before converting after adding items to their shopping cart. 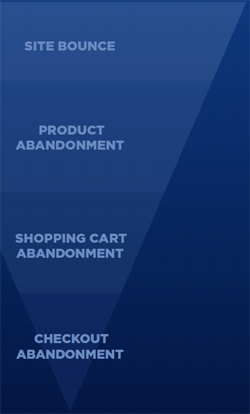 Checkout Abandonment Emails – Similar to a cart abandonment email, checkout abandonment campaigns begin when a user starts but fails to finish checkout. Although very similar in content to cart abandonment emails, these campaigns typically focus less on up- and cross-selling customers and more on getting users to return to exactly where they were. Post-Purchase Remarketing – There are few segments more willing to buy than satisfied customers. Don’t neglect these shoppers; sending emails to previous purchasers is a great way to get some sales and create strong relationships with your customers. 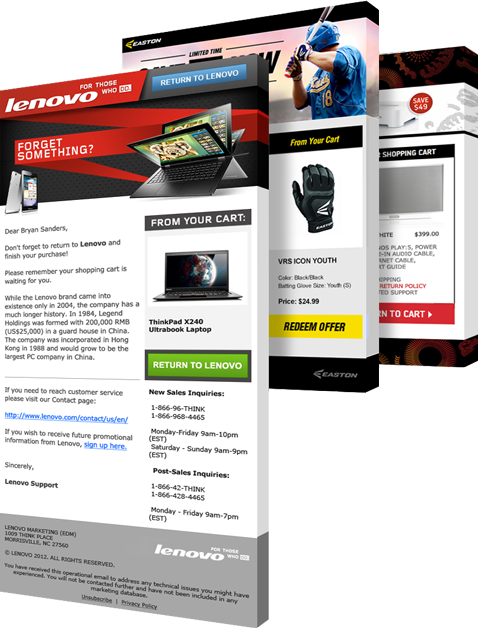 What is it about remarketing emails that makes them different from marketing emails? Aside from the contents of the message (which we’ll explore in a minute), there are a few inherent differences. Dynamic Email Delivery – Each remarketing email campaign begins as a reaction to user action. When a user abandons some goods in their shopping cart, an email remarketing campaign begins counting down until the first email is sent. Unlike other types of marketing campaigns, remarketing emails are in-step with shoppers from start to finish. Increased Open Rate – Remarketing emails typically have higher open rates than newsletters and other non-dynamically sent marketing emails. The reason for this is increased relevance. Picture this: A shopper visits your site and leaves only to find your brand in their inbox the following day. Your site’s shopping experience is only a day old in the mind of the reader, freshly relevant. There’s a good chance that the reader is going to open that email to see what you have to offer. Escalating Incentives – Escalating the incentive throughout the series of remarketing emails keeps a customers’ interest and increases campaign conversions. With dynamically sent emails, the timeline for your messaging can remain the same for customers who all open messages at different times. 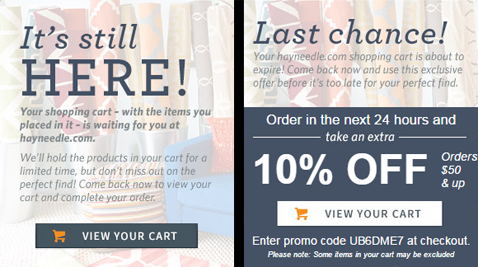 Hayneedle.com utilizes escalating incentives in their remarketing emails. You’re not sending discounts to the tens of thousands of users subscribed to your newsletters, you’re offering individuals precisely the deals they need to convert. Escalating incentives give vendors the ability to slowly nurture the idea of conversion in the mind of the consumer and match shoppers’ best offers. Some users may be willing to convert with a simple cart reminder, while other might need a week’s time and a 20% discount to fully commit. With a little bit of creativity and a whole lot of strategy, remarketing emails can be the most personalized piece of marketing content your business delivers. Why? These email campaigns begin with a shopper abandoning a page chock-full of personal details or with an already completed purchase. Either of these scenarios leaves you, the vendor, with a healthy amount of user details. What do I know about my consumers based on their behavior? How can I leverage that information to create an enjoyable, amicable experience for my readers? 1. Write Captivating Email Subject Lines – Create subject lines that are both relevant to message contents and align with both your audience’s and your brand’s personality. While there’s no perfect formula for a subject line (the best subjects are the result of repeated testing), it’s best to keep them short, honest, catchy, and free of the flagrant spam keywords. 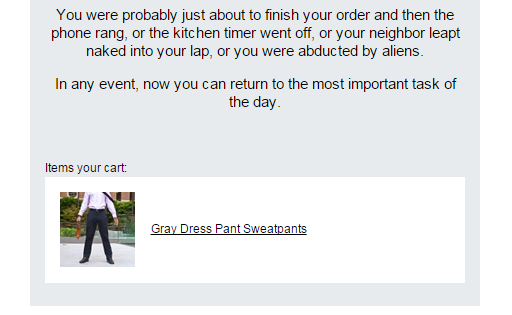 Betabrand knows their audience. “Naked-neighbor” messaging doesn’t work for all brands. 2. Address Shoppers by Name – Starting your message with a personalized greeting is a smart way to establish an immediate connection. Simply collect information from checkout pages to find shoppers’ first names. UpSellit’s PreCapture lead recovery technology can collect a shopper’s name and email address before a user clicks submit. 3. Present Product Images – When persuading a customer to reconsider the product they’ve left behind, what could be more convincing than to show shoppers the product they want? Use the shopper’s cart information to dynamically insert product photography. 4. Tell a Story – After you’ve made a good impression on your audience with imagery and a solid subject line, you need to assuage consumer skepticism with good messaging. Tell your user exactly why you’re making an appearance in their inbox, explain the benefits of the message, and provide in-line hyperlinks back to your site. 5. Include Click-Worthy Calls-to-Action – Each message should contain some attractive, attention-grabbing calls-to-action to give users a very clear indication of what they should do next and what to expect. Your eye should be drawn to these CTAs immediately. 6. Compliance Requirements – Depending on where your email recipients are, there are a number of requirements to keep in mind. These regulations can be a little tricky (At UpSellit, we have experience creating campaigns for over 50 countries), so we’ll just default to United States regulations for this blog. Each email must contain the sending entity’s name, a physical address, and a functioning unsubscribe mechanism. You have 10 days to honor unsubscribe requests. At the end of the day, what is remarketing’s purpose? To earn conversions from apprehensive shoppers while building your brands image and personality. Next time a remarketing email lands in your inbox, spend some time looking at the careful details companies include using the information you left behind. This article was syndicated from Business 2 Community: What Is A Remarketing Email?